A man who stole meat from Market Rasen Co-op and claimed he lost contact with the probation service after he was locked in a room by his mother, has been sentenced to a 20 day curfew at Lincoln Magistrates’ Court. Owen Lindop, 20, admitted failing to attend three supervision appointments in January after he was released from prison for shop thefts. The court was told Lindop had attended a number of post setence supervision appointments following his release from jail and his attitude was ‘very good’ until earlier this year. Lindop, of Middlefield Lane, Gainsborough, admitted failing to comply with his post sentence supervision on January 7, 19 and 27. 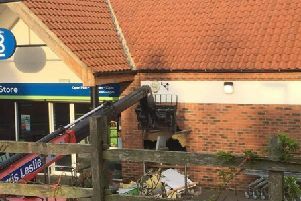 He also pleaded guilty to the theft of four beef joints valued at £24 from the Co-op in Market Rasen on May 1, 2015. The court was Lindop left the store without paying after placing the meat in his bag. Tony Cunningham, mitigating, told the court Lindop got in with the wrong crowd on his release from prison. Mr Cunningham said: “He started taking some legal highs. This upset his family and upset his mother. “His mother locked him in a room for a number of weeks. “This is when he failed to attend his post sentence supervision. On March 21 Lindop was fined £100 for the shop theft but it was deemed paid becacause he had spent a night in custody. He was sentenced to a 20 day curfew between 7pm and 7am for the probation breach.